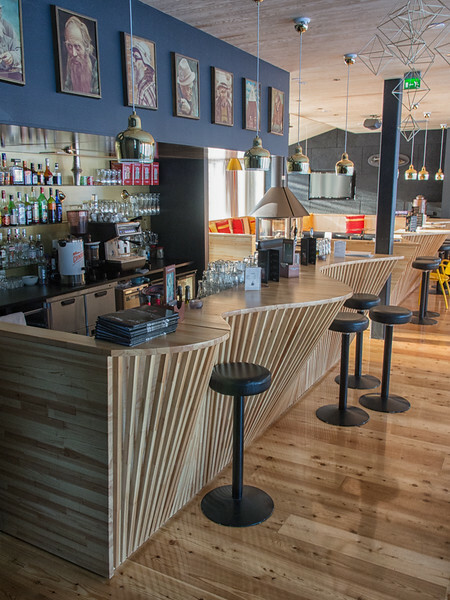 When I arrived at the Tradition Hotel Kultahovi in Inari, I had just crossed the border from Norway, where I had spent ten days traveling up the northern coast. The differences between the countries were noticeable as soon as I arrived in Inari. Of course, there was the obvious — the language, the landscape, the lower temperatures — but there were also subtle changes as well. Everything was suddenly cheaper, all of the windows were double-paned, and since we were now in Finland, hotels could lay claim to proper Finnish saunas. The riverfront sauna at Hotel Kultahovi, Inari. A few of the hotels (and even the cruise ship) I stayed in on the Norwegian coast offered saunas, but all except one were very like the saunas you would get in a spa — a separate room but still inside the hotel itself. At Hotel Kultahovi, they had a proper wooden sauna in a small riverside cabin. It was perfectly placed for a view of the roaring river rapids in the summer; in the winter, it looked out across the jagged, cracked ice. The front of the cabin was private; unless you were coming towards the hotel from the river, you wouldn’t see anything. I didn’t have time to go in the sauna, so I didn’t think much more of it until I walked out to the river for a northern lights scouting trip. It was then that I was taught my first lesson about Finnish saunas. As I walked alongside the sauna, I noticed smoke belching from the chimney and a bit of light. Then I turned the corner and found myself face-to-face with two Finnish men standing buck naked on the sauna’s patio. Looking down the River Juutua towards the riverfront sauna. I felt guilty about invading their space but I kept walking, knowing I’d be past them soon. They clearly weren’t particularly worried because they smiled, waved, and shouted “Hello!” over to me. Laughing, I waved and said “Hei!” back. They didn’t look like they even would have minded if I stopped and asked how in the world they were standing outside in -25C. Lesson learned: unless you want to converse with naked men, don’t walk in front of riverfront saunas. Funny experiences with Finnish men aside, Hotel Kultahovi was a good place to base myself in Inari. 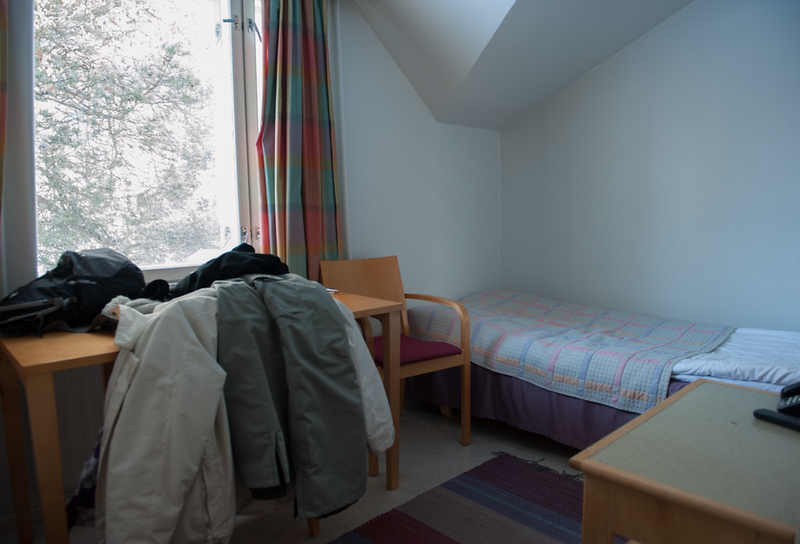 My room was simple but had everything I needed for a one night stay, including those previously-mentioned double paned windows (which meant I could sit right next to the glass at the desk and not feel cold). I could eat as many Arctic berries as I liked at breakfast, which I did. 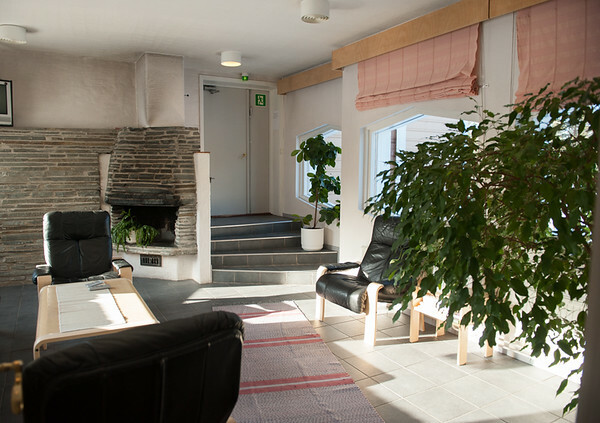 I also liked that there were lounge areas dotted along the corridors that were filled with greenery — something you don’t often see in Lapland in winter! Greenery in one of the lounge rooms that adjoined the corridors. The hotel itself has a strong Sami heritage. The owners are Inari Sami, part of the family that originally settled at the mouth of the River Juutua on which the hotel sits. Their ancestors used to fish for red trout there, in a river that is supposedly the best for trout fishing in the country. The hotel is the second oldest in Lapland; the original, pre-war building was finished in 1937. At that time, they had their own herd of 6-7 reindeer that helped to transport their visitors to both the north and south. 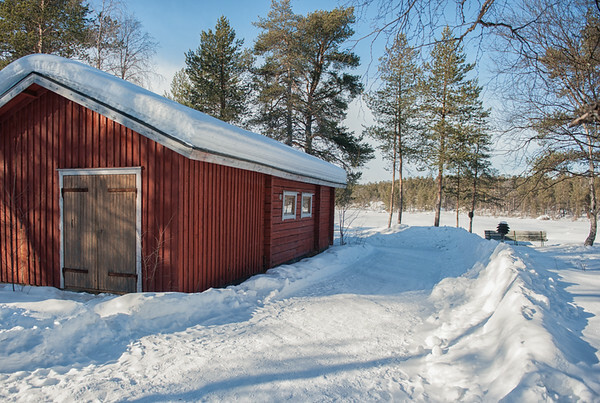 The original building was burned by the Germans, as most things in Finnish Lapland were, at the end of 1944. Only the cellar remained, on top of which the current hotel was built in 1956. My room (and my pile of winter clothes). While it would be hard to find somewhere in Inari that is not within walking distance of all the main attractions, I liked that the hotel was a short walk from everything yet perched on the edge of town where there wasn’t quite as much light (since I wanted to take every chance I could get to see the northern lights). 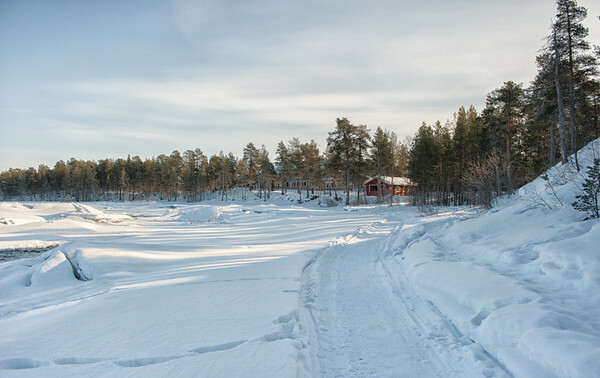 While there would have been even less light if I’d walked to the middle of Lake Inari, the jumbled ice over the river’s rapids provided a much more interesting foreground for my photos. Plus, it was nice to only have to walk to the back of the hotel to watch the aurora rather than all the way out onto a freezing lake! As luck would have it, the northern lights came out that night. 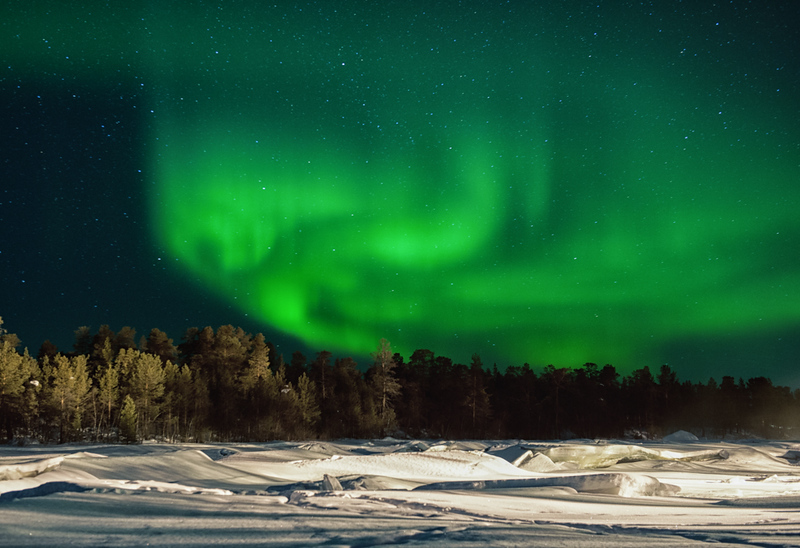 I stood next to the river completely on my own, listening to the roar of snowmobiles plowing along the lake and through the surrounding forest as the northern lights danced overhead. Swirls of green gradually engulfed the entire northern sky, each swirl surrounded by a tiny series of perfectly straight lines. It was as though all the Sami paintings I’d seen in the last few days had come to life. Just stunning. While I can’t promise naked men and northern lights during everyone’s stay at Hotel Kultahovi, I can say that it was a great introduction to the friendly Finnish culture and a nice place to base myself during my stay in Inari. What has your most surprising experience at a hotel been? I was a guest of Tradition Hotel Kultahovi, but all opinions stated here are my own. The hotel is open year round and single rooms start at €85. The River Hotel, a section of the hotel with larger rooms and personal saunas, has rooms starting at €125. So sorry Deb — I could have sworn I replied to your comment! Anyway, thanks so much for your kind words — it’s great to hear that you enjoyed following along on my Lapland trip. It’s hard to believe I still have so much to write about and I’ve been writing about it constantly since I got back! Anyway, the common areas in the hotel really were nice. It definitely made me think I needed to get some plants at home too! Did you end up getting any? Wow, that last shot is beautiful! A much better sight I’m sure than the naked old men. So sorry Suzy, I thought I’d replied to you a while ago! Anyway, thanks very much. And the northern lights were definitely a much better sight than the naked old men!